One slight change to the website is the drop of the Top 40 country chart. Due to the recent format tweak, our music now contains more classic country, soft oldies, and gold based adult contemporary songs. Therefore, much less emphasis on the new material, although I really didn't drop the currents. The hybrid format is basically a return to the first format I ever worked in radio back in 1979 at WTAL. They had been a Top40 pop station but had morphed into a softer AC-oldies-country format a couple of years before I joined the station. 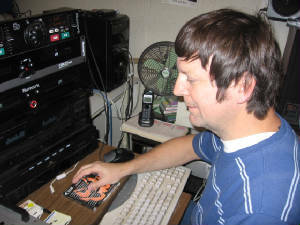 It was actually a very pleasant sounding format, and even as an AM station, had listeners in offices and lunch places. I'm still transitioning to what I hope would be the modern-day version of that format. It was a little less country-oriented than Bid D Radio is currently. I don't know why, but I used to pretty much receive all the currents. Lately, I guess with more labels, I get the CDX and DMDS titles, but several labels never responded. I get about 25 out of 40 currents these days. Big D's music policy is that we do not pay for current singles to play. We are already paying royalties and streaming fees, so the additional expense of buying singles is something we do not do. To get a current played, simply send me a CD or an mp3. While I am no longer using the charts as something to program by on a daily basis, I do keep up. The addition of the oldies and gold AC has also improved our listening hours and overall listenership. This was very much evidenced by the 10,000 listeners recently logged from the Washington DC area. The stream is being brought much closer to the variety format I am proposing for the FM station in Tallahassee. Got a siggestion, request or something to say? Let me know! Listenershop for October was way up! Big D ended October with a record 10,569 streams launched in the Washinton, DC area alone, and an overall total of just under 12,000 for the month. We have not seen numbers like this in a while. By now most of you have probably noticed the addition of softer oldies and some gold-based adult contemporary into the music mix. This is due to the loss of several station formats in the Tallahassee market. Florida's capital city no longer has adult standards, soft oldies, oldies in heneral, or classic country on terrestrial radio. I know one station can't be all things to all people, but we have a lot of displaced listeners in our area. If you don't like the handful of "canned" formats we have left, well, sorry, you are just out of luck. Drlta Star Radio, which is my nonprofit, is continuing to prepare for the LPFM radio opportunity. The FCC plans to meet on November 30, and on the agenda that day are the leftover translator applications dating back to 2003 - and the rulemaking needed to prepare for the LPFM filing window. I have retained legal and engineering counsel and have an almost-complete application (except for the part dependent on the FCC rules yet to be determined) in the Commission database. I would also like to thank "NBB" for their generous contribution of $500 to help us with our station needs. These gifts don't come along very often, so please know, I am very appreciative for your help. Thank you so much.